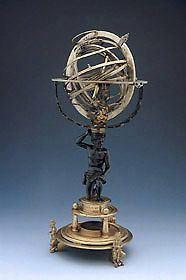 Although this armillary sphere comprises a great many rings which move within each other in a complicated manner, it does not demonstrate anything more than the motions of the sun and the celestial sphere; there are, for example, no planets. The complexity is some indication of the sophistication of contemporary ideas about celestial motion and the challenge of making this accessible through an instrument. The motions include rotation about the poles of the equator and, independently, the poles of the ecliptic. In addition an oscillation of the ecliptic itself, known as 'trepidation' is provided for by the rotation of two discs which add a further motion to the innermost ecliptic ring. All this 16th-century subtlety is set incongruously on a much later stand, the kneeling figure and the tiered structure beneath supported by satyrs representing a much more transparent effort at exotic composition.